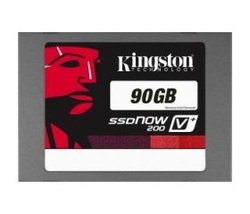 Since the beginning of our Best SSD For The Money series, Kingston's 16 GB S100 monopolized our most entry-level SSD position. Things are changing this month, though, as vendors try to unload their first-gen SandForce-based models. It costs almost as much to manufacture drives based on the controller company's second-gen hardware, which is significantly faster. 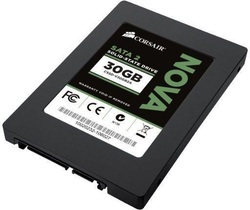 The result of this phase-out is creating a few really good deals, and that's why we're switching over to Corsair's 30 GB Nova 2. Although the Nova 2 gets our recommendation, we have to caution you about Corsair's specs. Sequential write performance for this 30 GB drive is overstated at 250 MB/s. The company provides a single performance number for all of its capacities, but we know that's not accurate. Actual write performance should max out closer to 100 MB/s or so. The speed of a low-capacity SSD might not compare well to larger models, but it's still going to be significantly better than installing your operating system on a hard drive. Our previously-recommended 16 GB Kingston S100 only worked as a Windows 7 32-bit boot drive due to the OS' space requirements. Windows 7 64-bit requires 20 GB, so shifting up to 30 GB gives you a little more freedom. There's not enough space to install much else; however, if you manually manage your space, booting from a low-capacity SSD can significantly improve system responsiveness. According to Ten 60 GB SandForce-Based Boot Drives, Rounded-Up, comparing the out-of-box performance of entry-level drives based on the company's second-gen controller reveals very few differences. What we do know, however, is that synchronous NAND enables slightly better numbers than asynchronous memory in certain situations. Because it does, in fact, employ asynchronous NAND, OCZ's Agility 3 isn't the fastest model available. But when it's priced at $75, you do get a reasonable amount of capacity for operating system files and a handful of critical apps. 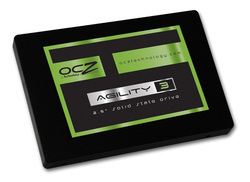 Moreover, OCZ's SandForce-based SSD does well with regard to power efficiency, too. So, it's getting our recommendation this month. SandForce-based SSDs come armed with one of three memory interfaces: Toggle-mode DDR, synchronous, and asynchronous. Although controllers are often said to play the biggest part in defining an SSD's performance, the type of flash memory used has a large effect, too. In fact, when you compare SandForce-based SSDs, the drives with Toggle-mode memory consistently come up as performance winners, despite their consistently-higher prices. If you're willing to pay for a little bit of extra performance, we find that Kingston's 90 GB HyperX 3K is a solid choice. Many of us find it inconvenient to manually track where apps and data reside across multiple drives. Higher-capacity SSDs cost more, but they also offer the freedom to worry less about where stuff goes, and to simply enjoy the speed and responsiveness of flash-based storage. We consider 90 and 96 GB drives the baseline for installing an operating system and all of your important apps without getting excessively expensive. From there, user data goes on a larger and more cost-effective magnetic disk. 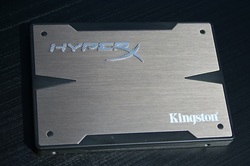 Kingston seems to agree, which is why its 96 GB SSDs have been such a success. Other vendors sell products at a similar capacity point, but among the 90 GB SSDs leveraging SandForce's second-gen technology, the V200+ impresses us with the lowest price tag. While SanDisk was a little slow to jump on the SandForce bandwagon, its new Extreme SSDs impress and join the ranks of Kingston's HyperX 3K, Patriot's Wildfire, and Mushkin's Chronos Deluxe. All four employ Toggle NAND and really help extract the best performance from SandForce's second-generation controllers. Fortunately, what SanDisk lacked in punctuality it makes up for with attractive pricing. 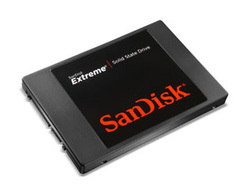 As the lowest priced 120 GB Toggle-mode SF-22xx SSD, we're recommending SanDisk's 120 GB Extreme for those who want performance and capacity. As we said, 90 GB is a floor of sorts for getting an OS and important apps onto an SSD. But 120 GB provides enough space to add personal files and big game installs to the mix. We know that SSDs based on SandForce's DuraClass technology demonstrate different behavior depending on the data with which they're presented. That is to say incompressible data like media-oriented files and actively-encrypted partitions isn't handled as elegantly as compressible information. In contrast, the behavior of Samsung's drive doesn't change based on the information it handles, and the 830-series drives are arguably the fastest MLC-based offerings available, generally outpacing Crucial's m4. 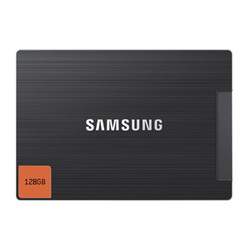 If you look at retail prices, the 830 costs just as much as the m4, too, making Samsung's SSD the better deal. There are a lot of good deals under $200 for enthusiasts looking to get the most capacity for their dollar. Although the 180 GB Agility 3 doesn't quite achieve the magic $1/GB boundary, it gets pretty darned close. As such, we're recommending it as a remarkable value.